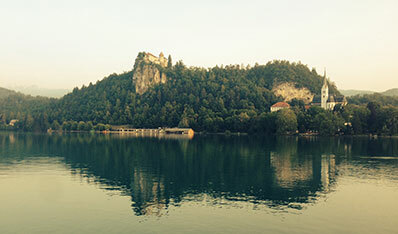 The sampling sites including biopsy locations, stranding sites and fishery harbours. Risso's dolphin median-joining haplotype network map. 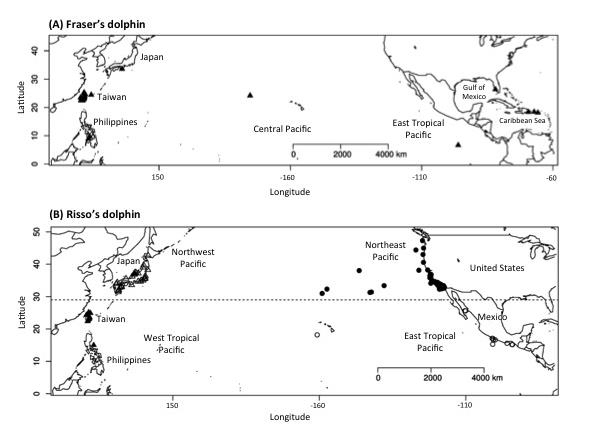 To assess the population structure in Fraser’s and Risso’s dolphins in the North Pacific and the pattern of connectivity among conspecific regional populations. 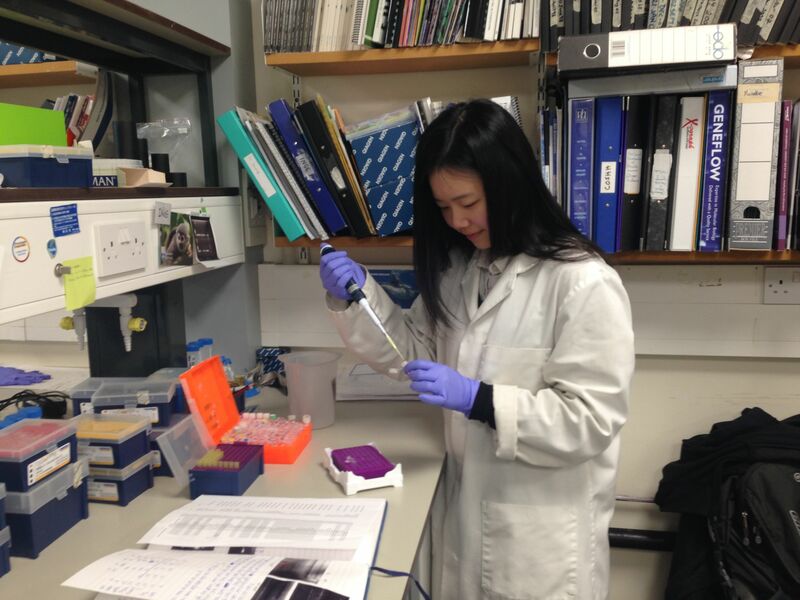 The study incorporated samples from 45 Risso’s and 47 Fraser’s dolphins from Taiwan, China into the broader study of 393 samples. To assess current genetic diversity level for local populations, effective population size, and historical demographic trends. 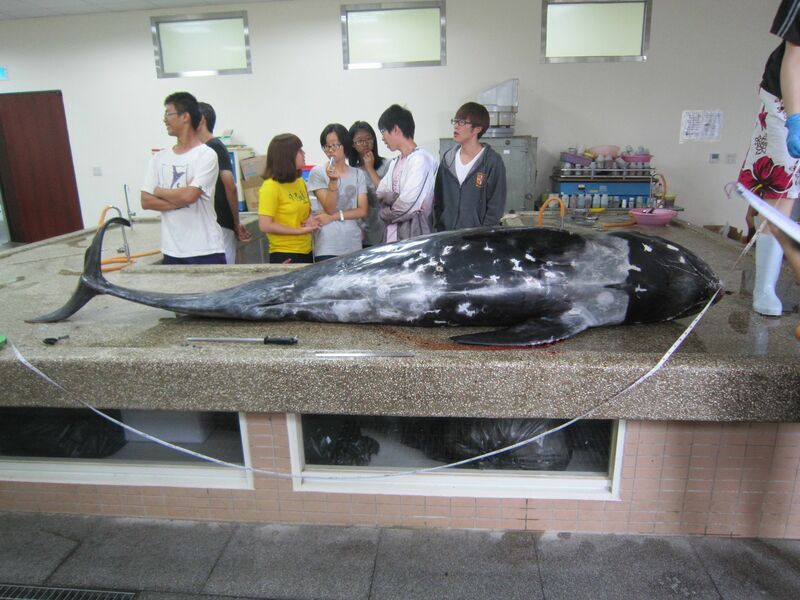 To assess the sampling origin, genetic and phenotypic characteristics of the group of ‘Fraser’s dolphins’ which was confiscated from an illegal whaling fishery in Ping Dong, Taiwan in 2005. 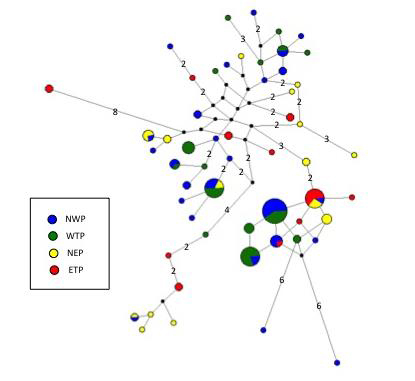 This will be based on multiple nuclear and mtDNA sequences, incorporated into delphinid sequence data available on public databases. To interpret these results in the context of available data on environmental factors and on historical/ongoing anthropogenic impact, and to prepare a conservation management plan for distribution to regional governmental authorities. The study provides novel data on the population structure of two dolphin species in Asian waters; Risso’s dolphins and Fraser’s dolphins. There is some indication of significant differentiation for all pairwise comparisons (between Japan, Taiwan and the Philippines), but the levels of differentiation seen among populations are low. There was no strong indication of population expansion or greatly reduced variation in any of the sampled populations for either species. Chen, I, Hoelzel, R. 2014. Defining the units of conservation and historic population dynamics for two small cetacean species affected by directed and incidental catches in the North Pacific. SC/65b/SM26. Click here to read.